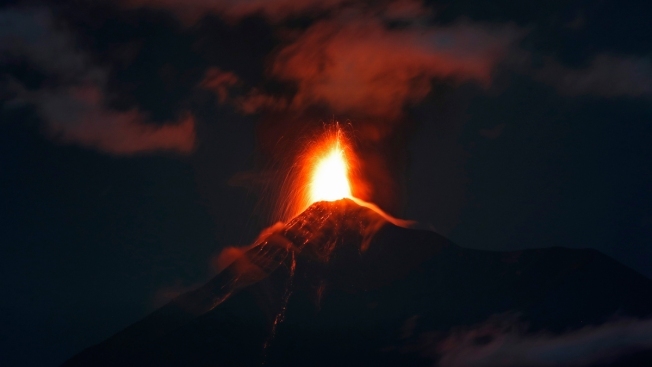 In this image taken with a long exposure, the Volcan de Fuego, or Volcano of Fire, spews hot molten lava from its crater in Antigua, Guatemala, early Monday, Nov. 19, 2018. Disaster coordination authorities have asked eight communities in Guatemala to evacuate and go to safe areas after an increased eruption of the Volcano of Fire. About 4,000 residents fled Guatemala's Volcano of Fire Monday as red-hot rock and ash spewed into the sky and cascaded down the slopes toward an area devastated by a deadly eruption earlier this year. Guatemala's volcanology unit said that explosions from the 12,300-foot high mountain shook homes with "constant sounds similar to a train locomotive." Incandescent material burst as high as 3,200 feet above the crater and flows of hot rock and ash extended nearly 2 miles down one flank of the volcano. Hot blasts of pyroclastic material pushed down canyons on the slopes, while a column of ash rose nearly 23,000 feet above sea level and drifted toward Guatemala City to the east. Hundreds of families heeded the call of disaster coordination authorities to evacuate 10 communities, piling into yellow school buses for trips to shelters. The national disaster commission said 3,925 people had been evacuated by early Monday. 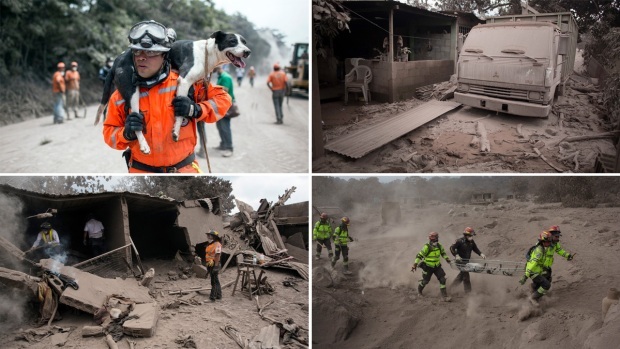 Thick black ash engulfed Guatemalan communities as rescuers rushed to save lives. The Volcano of Fire is one of the most active in Central America and an eruption in June killed 194 people. Another 234 are officially missing, although organizations supporting the communities have insisted there are thousands of missing persons. It spewed more ash and hot rock in October, prompting warnings for the nearby communities. The biggest danger from the volcano are lahars, a mixture of ash, rock, mud and debris, that can bury entire towns. However, by Monday, there had been no reports of such flows reaching populated areas, though authorities were taking no chances; they were harshly criticized for not calling for evacuations earlier in June. Four shelters have been set up for evacuees. Dora Caal, 26, and five members of her family took refuge under a nylon tent at a sports stadium in the nearby town of Escuintla. "Last night we heard the volcano roar, you could see fire, we couldn't sleep," said Caal, whose town of El Rodeo was largely evacuated. "At dawn we said we'd better get out, we were afraid," Caal said as the sun beat down fiercely at the improvised shelter. People like Caal are still reeling from the effects of the June eruption. "Back then I lost my job at a farm that was on the slopes of the volcano. They closed it and we can't work there anymore," she said. Enma Hernandez, 42, left her home in El Rodeo to evacuate, but her 20-year-old son stayed behind to protect the family home from looters. In fact, many men stayed behind in the town; there were mainly women and children at the shelter.